I thought up the sigh. I out of chaos led. The tub of blood behind. The waker from fallen slumbers. Where I was a seed again. “The Baby” is part of a sequence of poems from James Reaney’s play One-man Masque, first performed by the author on April 5-6, 1960 at the Hart House Theatre in Toronto. You can also find the poem in The Essential James Reaney (2009), available from The Porcupine’s Quill. 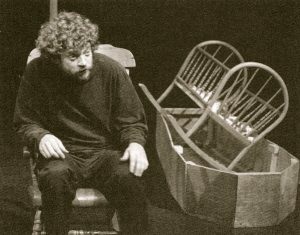 One-man Masque (1960) is available in Two Plays by James Reaney, along with Gentle Rain Food Co-op (1997), published by Ergo Books in 2003.